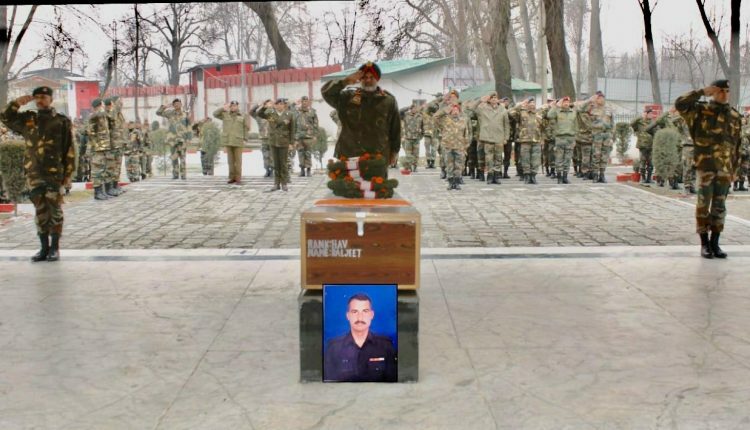 The Army on Tuesday paid tributes to Late Havildar Baljeet who was killed in an encounter at Ratnipora area of south Kashmir’s Pulwama district today morning. The army paid the befitting tributes Havildar Baljeet who was killed during a counter militant operation at Village Ratnipora of Pulwama, wherein one militant was also killed, a defence spokesman said in a statement. “In a solemn ceremony at BB Cantt, Lt Gen KJS Dhillon, Chinar Corps Commander and all ranks paid homage to the slain army man. In a show of solidarity, representatives from other security agencies were also present to pay their last respects to the martyr,” the spokesman said. Late Havildar Baljeet, sustained bullet injuries during a fierce operation at Ratnipora village. He was provided immediate first aid and evacuated to 92 Base Hospital, but succumbed to his injuries, he said. “The mortal remains of the slain were taken for last rites to his native place, where he would be laid to rest with full military honours. In this hour of grief, the Army stands in solidarity with the bereaved family of the martyr and remains committed to their dignity and well being,” he said.